Earthquakes remind us that God’s Word is true. The Lord Jesus warned that the Great Tribulation at the end of the church age would be preceded by “earthquakes in divers places” (Mt. 24:7; Mr. 13:8; Lu. 21:11). 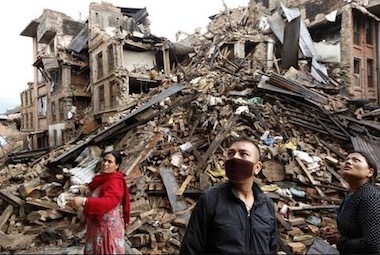 More than 800,000 people have died in earthquakes since the turn of the 21st century. January 2001 -- 25,000 died in a quake in India. Enzo Boschi, head of Italy’s National Geophysics Institute, said the December 2004 earthquake was so strong that “All the planet is vibrating” and Washington Post reporter Michael Dobbs compared it to “a scene from the Bible” (“Disaster compared to scene from Bible,” WorldNetDaily, Dec. 26). In fact, as devastating as recent earthquakes have been, this is only a warning of what lies ahead. At the very opening of the seven-year Tribulation one-fourth of the earth’s population will die from war and famine (Rev. 6:7-8). A third of all the ships in the seas will be destroyed (Rev. 8:9). A third of the waters on the earth will be poisoned (Rev. 8:10-11). A swarm of demonic locusts will torment men with stings so fearful that they will seek death but “shall not find it” (Rev. 9:1-6). A third of the world’s inhabitants will die when an army of 200 million men marches from the east (Rev. 9:15-18). The antichrist will rule and require that all men bow to his image and take his mark or die (Rev. 13:11-18). The sun will become so hot that men will be “scorched with great heat” (Rev. 16:8-9). A terrible shaking of the earth will cause every island to sink and the mountains to fall (Rev. 16:20). Hailstones weighing 75-95 pounds will fall from heaven (Rev. 16:21). Men’s hearts will fail “for looking after those things which are coming on the earth” (Lk. 21:26). The good news is that no person living today has to go through these horrible judgments. We are still living in the era of “good tidings of great joy, which shall be to all people” (Lk. 2:10), which is the gospel of Jesus Christ, that He died for our sins, was buried, and rose the third day to offer eternal salvation to whosoever will believe in Him as Lord and Saviour. The Bible says God has no pleasure in the death of the wicked (Ezek. 33:11); it is His will, rather, that all men be saved (1 Tim. 2:3-4; 1 Pet. 3:9).